Getting the world ready, one machine at a time. Had to rebuild my WSUS Server recently and I decided to write down some notes for how I setup my machine. I created a simple Virtual Machine running Windows Server 2012 R2 on one of my Windows 8.1 Host machines. 2GB Dynamic Memory, and a 500GB Local Hard Disk work great. I don’t use the WSUS machine for day to day updates of my clients, instead the server is setup only for Imaging, it works great as a cache when re-creating test images over and over, so I don’t have to download each time. I basically configure my environment to just download and auto-approve everything *except* drivers. I don’t need drivers in my Imaging Environment, and I have see some comments that Driver Management in WSUS is problematic anyways. Then I set the Synchronization Schedule to run every day. .NET Framework version 4.0 – Since we will be eventually be installing .NET framework 4.5. Version 4.5 already includes version 4.0 anyways. Say you have two installation packages, KB555555 and KB666666. They both fix different things, but they patch the *same* file: ntoskrnl.exe. If we install both packages, which one wins? Well Update packages understand when given two packages, which one supersedes the other. That also means that if KB666666 supersedes KB555555, then you don’t even need to install KB555555 because it is going to be replaced anyways. There is a lot of work in the WSUS internal database to keep track of all of the interdependencies, and supersedence. 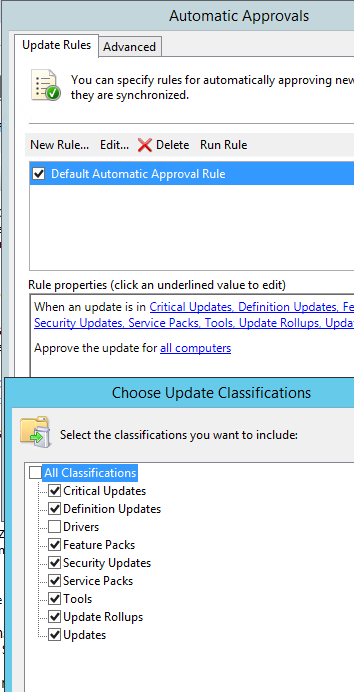 To keep things running smoothly, I recommend performing a “WSUS Server Cleanup Wizard” occasionally to ensure that Superseded updates are getting declined in the database and not being offered to clients. First thing to check is to open up the ZTIWindowsUpdate.log file to see what installed and what didn’t after your installation. Occasionally you may start to encounter problems during your installation, bad packages, and other mysterious installation errors. For most errors, running the “WSUS Server Cleanup Wizard” is one of the quickest things you can do to clean up the machine and remove some obvious errors on the Server. If you need more help, it would be good to look at the c:\windows\WindowsUpdate.log file to see if it gives any more hints as to what the problem is. One of my least favorite updates is the “Definition Update for Windows Defender”, this update has all kinds of problems, loading in my environment. The problem is that Microsoft updates this package about *once a day*. So if you spend time trying to narrow down the bad update, Microsoft will have pushed out an updated version just to confuse you. Best advice, if you encounter an error, and it’s blocking your reference image install, just block the specific update instance in WSUS and try again.